The Edge, Endcliffe, 34 Endcliffe Crescent, Sheffield. S10 3ED. The Innovation Caucus is hosting a free event to explore how the social sciences can contribute to the Industrial Strategy. This event will help social science researchers to engage with the Industrial Strategy and ensure they’re well positioned to participate in calls under the Industrial Strategy Challenge Fund (ISCF). 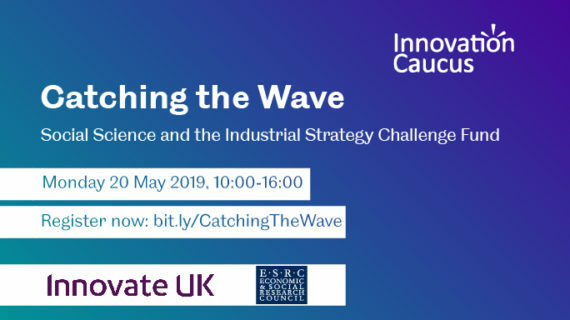 ‘Catching the Wave’ is open to all social scientists who are keen to engage with the Industrial Strategy. With numerous calls live under Wave 2 of the ISCF, and the priority themes of Wave 3 now announced, this will be a valuable and timely opportunity to generate ideas and build connections. To start the day with presentation about the development of the Industrial Strategy Challenge Fund we have Dan Hodges (Deputy Director – Strategy, Innovate UK) as our first keynote speaker. Dan will reflect on the “Industrial Strategy and the Social Sciences in ISCF Wave 3”. This will be followed by a panel discussion exploring ‘How the Social Sciences can add value’, where there will be an opportunity to put your questions to panel members, including Sarah Hodgetts (Deputy Director, Department of Business, Energy and the Industrial Strategy and Ben Peace (Head of Manufacturing at the Knowledge Transfer Network) (tbc). After a networking lunch, we’ll convene round table and plenary discussion, to explore opportunities for social scientists to collaborate and engage with the ISCF. There will be groups focusing on each of the grand challenge areas (Ageing Society, Artificial Intelligence and Data, Clean Growth and Future of Mobility) and related to the shortlisted ISCF Wave 3 challenges. The session will focus on identifying how to frame and articulate the value and offer of social science research when engaging with partners from business and other STEM disciplines around the Industrial Strategy. The final session we are delighted to have Melanie Knetsch (Deputy Director of Impact and Innovation, Economic & Social Research Council) who will outline the “ESRC’s Business Engagement Vision”. Mel leads on ESRC’s strategic knowledge exchange and innovation activities to ensure its research portfolio is visible to potential users, and has been instrumental in ensuring social science is the golden thread woven through the ISCF. This will be followed by the second panel discussion, focusing on ‘Experiences of ISCF and the Industrial Strategy’. Panel members, including Professor Jacqueline Glass (University College London), Professor Simon Collinson (University of Birmingham), Professor Lucy Kimbell (University of the Arts London) (tbc) and Professor Katy Mason (Lancaster University). This group of academics will share their experiences and perspectives on working on projects linked to the Industrial Strategy and the ISCF. This event is for ALL social scientists, and we hope you can join us in Sheffield for an interesting day with a practical focus aimed at generating insights and sharing lessons to help the social sciences gear up for future ISCF funding calls.